This week’s #ThrowbackThursday of the first film in a franchise that, honestly, surprised everyone by being the giant in the film industry it is today. After all, the eighth installment (at this time of writing) The Fate of the Furious is hitting theaters worldwide and continuing the trend of departing far from what the franchise started out as. 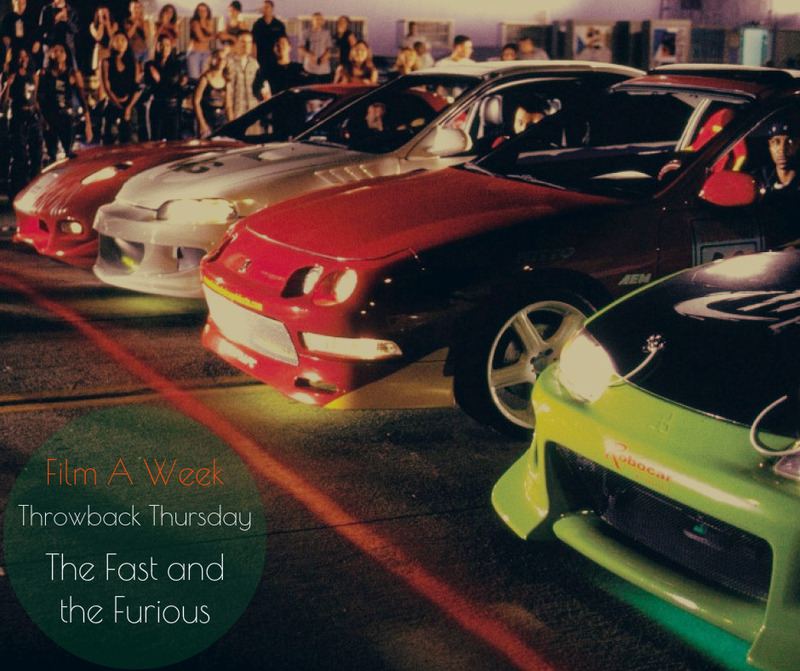 Let’s take a look back at 2001′s The Fast and the Furious. 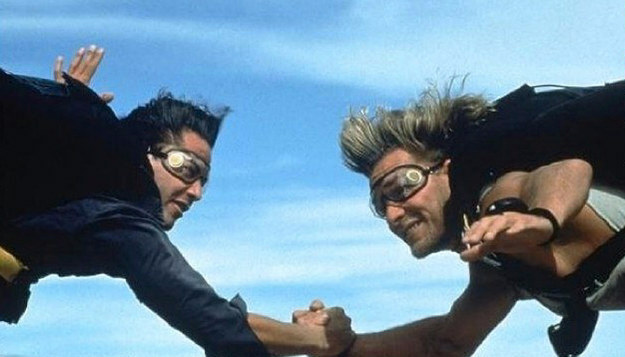 Released on June 22, 2001, (the day after my ninth birthday, but neither here or there), Fast was a hit on the weekend it open by hitting some high marks expected in a summer film, but this one struck a chord by appealing to a younger market and a more culturally diverse market, even from the get-go. Brian O’Connor (Paul Walker) is an undercover LAPD officer investigating a heist in which the thieves used modded street vehicles to help steal the most expensive Panasonic devices ever featured on film. O’Connor decides to use his cover and information to his advantage by working in a local auto parts shop. From here, he meets Mia Toretto (Jordana Brewster) at a loclal small market for a quick sandwich, where he gets informed about a illegal street race going on the same night. 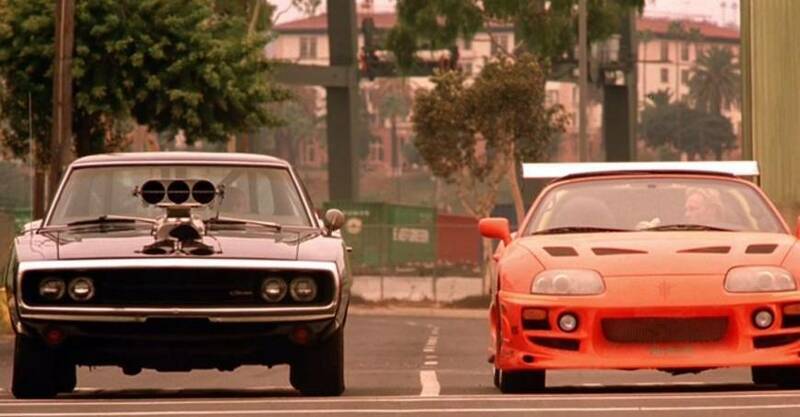 O’Connor is then met by Dominic Toretto (Vin Diesel) at the race to engage in a competition filled with NOS-fueled action, amazing stunt work and all the Ja Rule one could ever want on film. 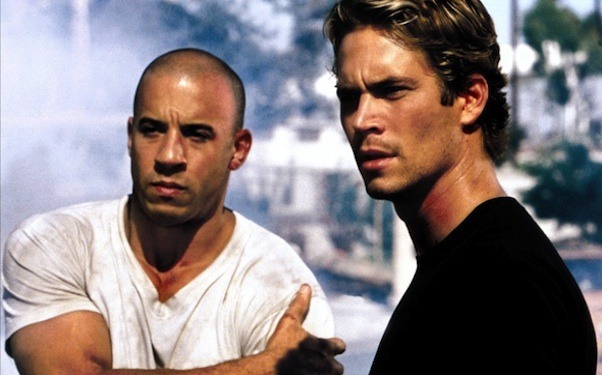 The two form a fast friendship and eventually gets to know the Toretto’s more including meeting Domn’s tough-as-nails girlfriend Letty Ortiz. This leads O’Connor to dive into the illegal race world, helping Dom fend off his rival Johnny Tran (the underrated badass that is Rick Yune) and see if their new bond can overcome the new information that comes to light in the case.If this plot sounds familiar, it isn’t just because this film has been probably watched by anyone reading a hundred times. It’s because this is a more updated version of 1991′s Point Break except with cars. In fact, I covered that years ago on the original Film A Week. In that respect, it is a sub-par version of Point Break lacking in the same charm as that film with awkward dialogue and no real chemistry between any characters. It feels forced and no one feels natural. Walker was still finding his groove, but is quite bland in this. Then again, O’Connor is not exactly given the best lines nor has anything memorable to say. Diesel does his best with the work given and not a horrible actor. He captures the charisma of the top racer, commands a presence and makes the character. He is no Patrick Swayze, but who is.When the two interact, however, it feels less like a real friendship and more like a forced concept of a bond. Maybe it was intentional as O’Connor is undercover, but even with that said, it doesn’t work. Even when Walker is with Brewster, the chemistry is as palpable as seeing paint dry. The plot itself is also hindered by the fact that Point Break exists because it took the base of the plot and allowed time for the characters to understand and get to know each other. In here, interaction feels as an afterthought because of the true stars of the film being the car races and the action. The action directed by Rob Cohen throughout the film is quite good with capturing the thrill of the race, the adrenaline that rushes throughout and the white knuckle thrills of defeat. It has an impact and intrigues us into seeing what happens next. In the moments of gun play and fist fights, Cohen knows to keep the camera on what is going on compared to modern action that seems to fall all over the place (save for John Wick). One moment in the film that is a personal favorite is in the final minutes of the film. The sequence of Dom ready to escape and outrun O’Connor and a train is brilliant. the tension builds and builds so that when they jump over the track, a sigh of relief comes to calm the senses as Dom’s Charger gets wrecked. It’s a great moment in cinema and plays to a strength sorely lacking in the film. The Fast and the Furious is not exactly a great start to a franchise, but this franchise does not get good until Fast Five. Yet, it was successful for Universal and for the cast as a surprise hit that would have suffered at another time. It was refreshing, exciting and fast-paced, even if looking back is a bit cringe-worthy. Yet, with all families beginning, it can be rough and, luckily, it blossomed into something greater, faster and more furious later on.